Bicycle Kits are sold complete with all necessary equipment, "ready to ride". Billet engine mounts are located on the frame. All wiring is included and installed. The spark plug wire, engine kill, and throttle are tied to the frame for easy attachment when the motor is installed. Engine Kits are sold separately. Installation into the Ridley's bicycle kit requires some mechanical ability, but can be installed and running in less than one hour. The Twin might be as close to "vintage" as it gets. From its vintage white wall tires to the British green color and chrome accents, the Twin will impress even the toughest critic. Ridley's Vintage Motorbikes are about a lot more than just function. These unique bicycle kits are admired because of their fit and finish. The attention in every detail translates into a real high quality piece of art. To learn more about what makes these the ultimate motorbikes the one you want, visit our Gallery. Price does not include retailer prep or destination charges. Average destination charge is $200. The Twin model is currently available through Vintage Motorbike Retailers. 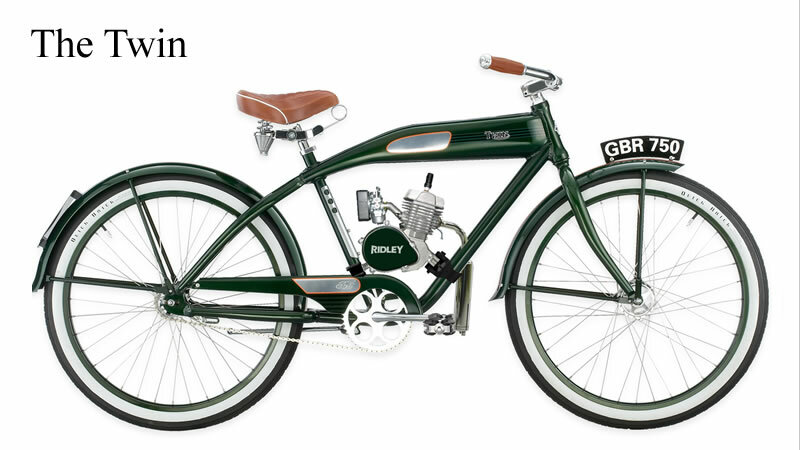 Ridley Vintage Motorized Bicycles, Vintage Styling, Motorbikes, Felt Bicycles with motors, Motors for bicycles, bicycle motor, bicycle engine, bicycle engine parts.